In their 43 year history, they’ve appeared in only two Stanley Cup Finals. With this being their second appearance, the Washington Capitals made the most of it and finished off the Vegas Golden Knights in five games. After a high scoring back and forth affair in Game 1 that ended with a victory for Vegas, the Capitals proceeded to win the next four in dominant fashion. Sure, three of the four victories were by two goals or less, but watching those games left no doubt who the better team was. Not taking anything away from what the Vegas Golden Knights were able to accomplish in just their first year of existence, but Washington matched their physical play and couldn’t be stopped on offense. Especially on the power play with the Capitals pinpoint passing. I said going into this years final that Alex Ovechkin in my opinion was now the greatest player of this generation. That opinion wasn’t going to change if Vegas won the series instead. What changed from last year when I said that Sidney Crosby was the best player of his generation? For me it’s simply the fact that when Crosby plays defense, which he does exceptionally well, it has a lot of finesse to it. Ovechkin on the forecheck is something to watch. You never see a 50-goal scorer playing the way he does on defense. This wasn’t just about Ovechkin as the Capitals together avoided another early exit by playing to their strengths and never giving an inch. Vegas did the same throughout the season, but couldn’t match the Capitals ferocity on offense. 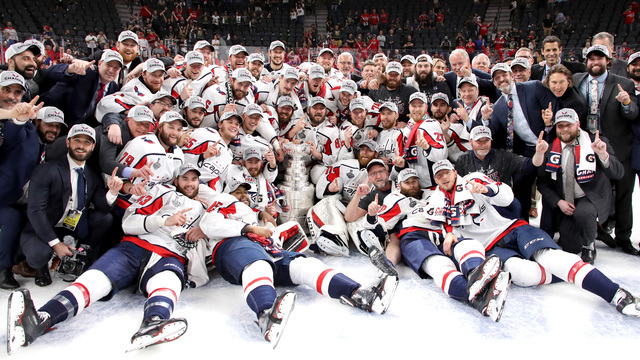 Congratulations to the Washington Capitals on winning their first Stanley Cup championship. It was well deserved.